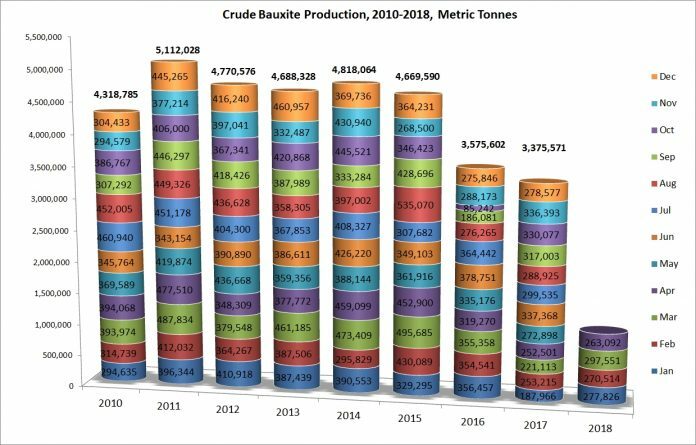 The Image illustrates the monthly production of crude bauxite in metric tonnes from January 2010 to December 2018. Click on the Image to enlarge. Most of Jamaica’s crude bauxite is extracted from the ground and converted into alumina. However, one plant on the north of the island still exports crude bauxite through Port Rhoades near Discovery Bay. This plant is majority owned by the Jamaica Bauxite Mining Company Limited, a Government of Jamaica entity, but it is operated by New Day Aluminum from the United States of America. The jointly owned company is known as Noranda Jamaica Bauxite Partnership.